At the end of many fine meals in Portugal, the server pours you a special treat. It may be aguardente (a grape-fueld brandy/firewater native to Portugal) or it may be Port. Or you may get lucky and have a glass of Moscatel de Setúbal set in front of you. At that point, you smile, because you’re about to sip your dessert, in the form of liquid gold. 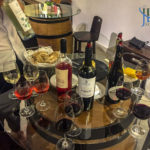 For this reason alone, we made plans to visit Setúbal, to drive more deeply into the luscious wines we’d sampled over the past few years. 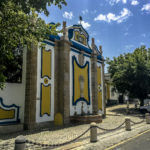 But we found other reasons too: the rich, tangy queijo d’ Azeitão, a famous crafthouse for azulejos, and, of course, the rest of the wines of the expansive Setúbal and Palmela DOCs. 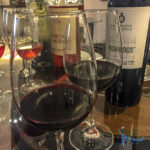 Last summer we made our initial exploration, and we started off with an experience we can recommend to anyone with the most passing interest in wine, food, and Portugal outside of Lisbon. 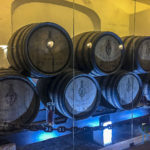 We arranged for a special tasting at José Maria da Fonseca, a longtime producer of a wide range of wines, including a famous 20-year Moscatel de Setúbal that we knew we must try. We began our day touring the lovely workshop housing Azulejos de Azeitão, worthy of its own story. 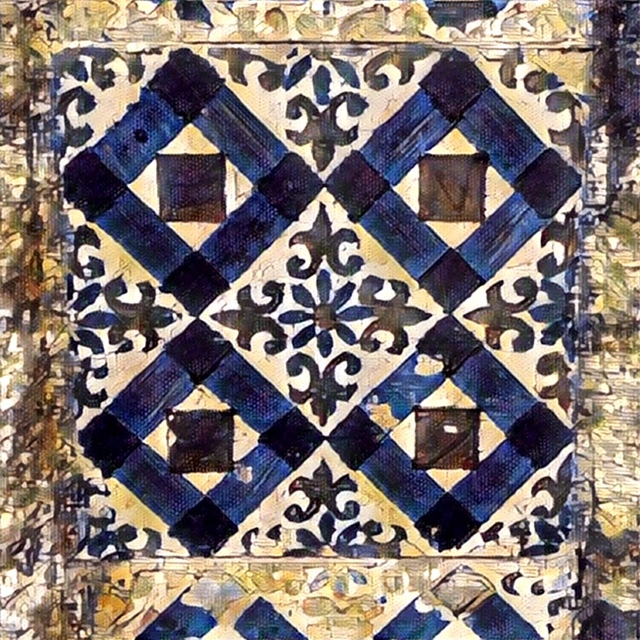 After picking up a couple of hand-painted tiles. to bring home, we wandered into Vila Nogueira de Azeitão in São Lourenço for lunch. Café Lavadouros offered tabuas of presunto and cheeses to enjoy with a glass of white wine as we contemplated the old washing area that the café had brought back to life. Rose petals floated in the water of the old lavadouro, and we escaped the heat in the shade of the overhead vines. 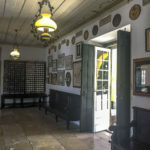 From there, we crossed the street to the main estate house of José Maria da Fonseca. Our tour began with stories punctuated by pictures and old casks, and photographs on the walls of the family and its history in the area. 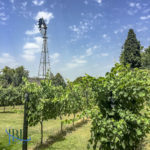 We walked out to wander the vines in the estate’s garden, knowing far more grew in various corners of the DOC to produce the estate’s wide range of white and red wines, as well as the flagship Moscatel. We went into the oldest warehouse, and in the cool darkness therein saw the origial Perquita mural made of brown azulejos on the wall. 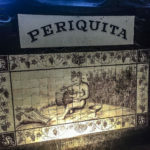 The “Periquita” brand is commonly known around Portugal as a great everyday wine—we’ve had it quite often ourselves. Still, it felt like far from a modern scene, with ghosts hanging from the rafters. 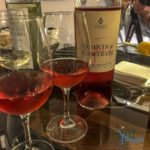 Full of tales and legends, we returned to the main house for our tasting, which featured five wines from the range of reds and whites, plus the 20-year Moscatel de Setúbal. 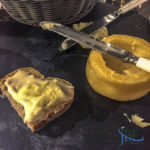 We would enjoy an early petiscos, with more Azeitão cheese (I couldn’t get enough) crowned by a pairing of torta de Azeitão with the aged moscatel for dessert. We descended upon the barrel table with relish. 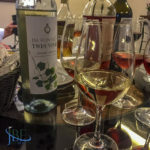 We began with a Vinho Verde from the company’s estate in the north, then segued into a rosé of Touriga Nacional and Cabernet Sauvignon. 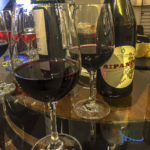 Next was a fan-favorite red, the Pasmados from VR Setúbal, blended from Syrah, Touriga Nacional, and Castelão (the primary red in the viticultural region). The second red, the Ripanço, from Alentejo, featured tinto grapes destemmed by hand in a traditional process. 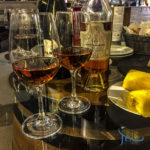 We had a young moscatel to set our palates to the next course, then out came the Alambre, the aged moscatel—the youngest wine within the blend would be 20 years old. Served with the older moscatel, the torta wrapped an egg-forward sponge cake around a filling of golden plums (gemas) local to the area, and spiced with cinnamon. 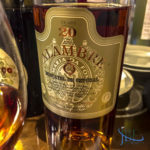 It marries beautifully, as you might expect, with a young moscatel—though I found the aged Alambre could be enjoyed more fully on its own. The Alambre remains firmly in my memory for its lucious tropical fruits so bright and complex on the tongue—this is not a cloyingly sweet wine, but a broad, open partner to a relaxing evening under the turning leaves as the autumn sun sets. Caramel, plums, and a touch of rosemary round out the flavors. 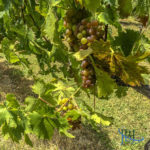 It’s made, after all, from the intensely floral Moscatel de Setúbal grape—in fact, we grab up these grapes in the market in September and early October, as even eating them out of hand sends waves of florals and stone fruits over your tastebuds. 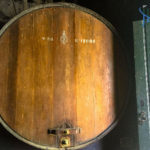 I’ve lost my specific notes to the vagaries of time, but will add more details as we return to each of the wines over the coming months—they were all well chosen and worth the cost of the tour and tasting (about €55 for the two of us). Further aged versions of the Alambre are available, and we look forward to exploring those too, at a future date. We finished our afternoon with a nap under the trees on the town’s praça (no one seems to mind if you do these things), and a couple of bottles of the Pasmados and, of course, the Alambre to take back to the U.S. with us as holiday gifts. 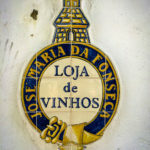 José Maria da Fonseca’s main estate is generally open every day, from 10 am to 7 pm, but appointments are recommended for special tastings as we had, on July 13, 2017. Also, as with all food and wine experiences in Portugal, call ahead if you’re planning to drop by to ensure that local holidays and vacations aren’t being observed.